Take a journey inside the creative mind in this week’s podcast interview with fine artist and tutor at the New York Academy of Art, John Wellington. In this interview, the former DC and Marvel colorist draws on his years of experience to give you a wide range of insights into what it really means to be creative. John Wellington has taught traditional painting techniques at the New York Academy of Art and in his own atelier for two decades. For more than three decades, he’s been exploring themes such as popular culture, death and immortality, and religious idols in his paintings. In 2015, he also began creating sculptures which incorporate similar themes. Prior to this, John worked as a colorist for DC and Marvel comics for almost 10 years, where he created covers and worked on a wide range of popular titles. So how does he stay so creative, and what can you do to find inspiration and progress in your art career? In this fascinating journey inside the creative mind, John shares a wealth of information drawn from his own experiences and a tutor to countless students. You’ll hear about the artists who have influenced him over the years, and why ‘selling out’ doesn’t necessarily mean compromising your own personal vision for your art. But. perhaps most importantly of all, you’ll learn some key techniques for improving your own art and developing the right mindset to help you stay creative – even when the going gets tough. 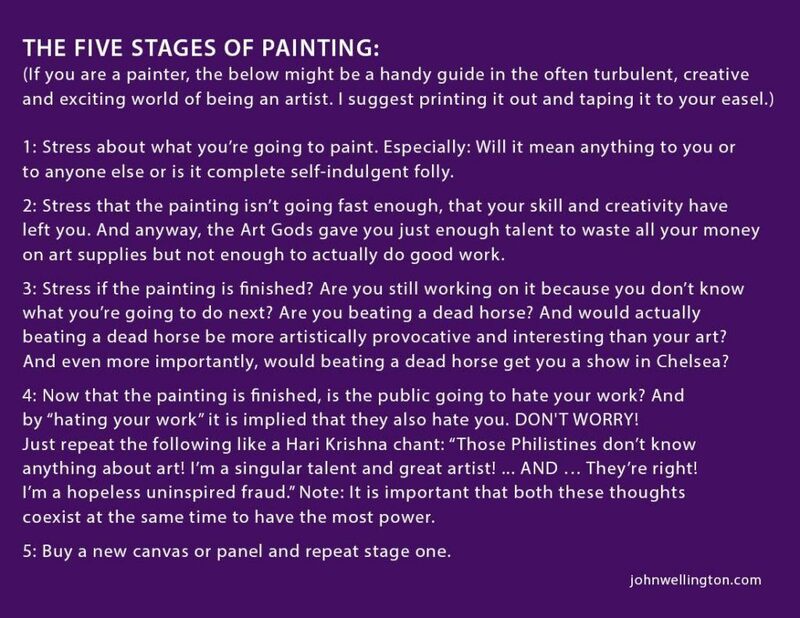 Here are Wellington’s 5 stages of a painting, followed by his 5 rules of painting. 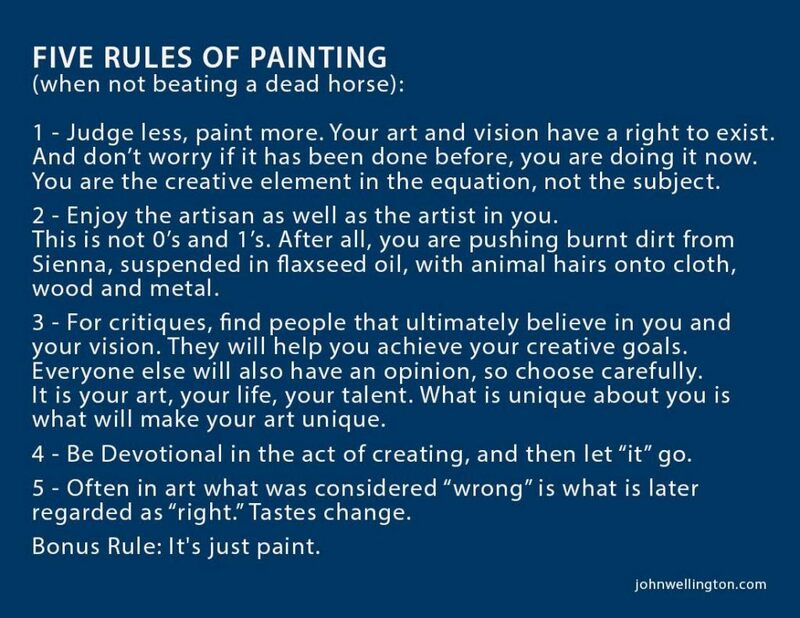 You might want to download these, print them out, and pin them to the wall of your studio space or work area. They’re sure to bring a smile to your face and give you an extra spark of motivation and inspiration when you need it most. We hope this week’s podcast interview and journey inside the creative mind with John Wellington gives you plenty of inspiration for your own art. Be sure to check out John’s incredible paintings and sculptures on his website. His blending of classical themes and iconography with contemporary references such as Manga makes for an exhilarating journey!